Takara 12 Neo Blythe Doll Charlotte des Fleurs. Takara Neo Blythe Doll Charlotte des Fleurs. 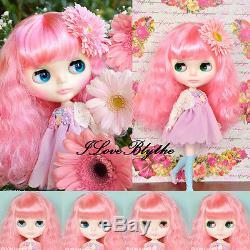 Let flowers show the feelings you wish to convey with Neo Blythe Charlotte des Fleurs. Flowers are not just a thing of beauty , but they carry messages of love, appreciation, gratitude and your deep feelings. Charlotte understands your feelings and will help choose the perfect ones for you. She has a striking appearance with her fluffy cotton candy hair. Her pastel dress has a transparent overlay. She wears a lovely lacy bolero and tulle socks. She has clusters of flowers at the bodice of her dress and the hem of the dress is rounded like little flower petals. She wears light green eyeshadow and soft pink lips and cheeks. She has a special blue front facing eye color. Her face type is Radiance + in fair skin. 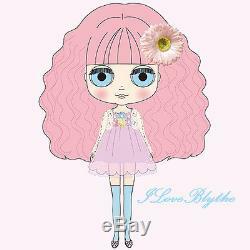 Face Type: Radiance + Skin Type: Snow Make-up: Green eyeshadow, pink lip, pink blush Eye Color: Light Blue (special front facing), blue, pink, and green Hair Color: Pink The set includes: Doll, dress, bolero, socks, hair accessories, shoes, underwear, and stand. Release Date: March 14, 2014. ITEM IS MINT IN ORGINAL SEALED PACKAGE 100%brand new NEVER BEEN OPENED Around 12 tall. View all items in my sdGallery. View a sample of my other auctions below. View all my items in my sdGallery. The item "Takara CWC 12 Neo Blythe Doll Charlotte des Fleurs" is in sale since Monday, March 28, 2016. This item is in the category "Dolls & Bears\Dolls\By Brand, Company, Character\Blythe".